jaunty bear, originally uploaded by jahansell. 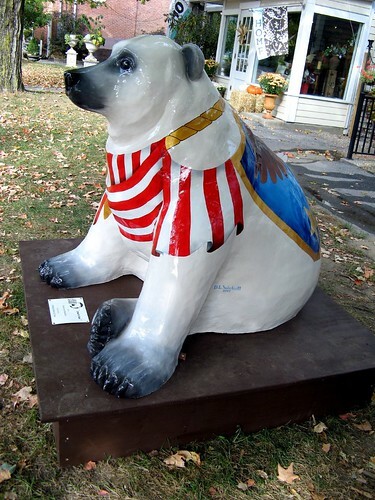 So many towns have have animal invasions - the Cow Parade, or pigs, or dogs... it only seems appropriate in the northwest corner of Connecticut that we should get Bears. The Bear Affair was organized by the Northwest Council on the Arts, and I was on a committee to help select the original designs, of the several hundred that were submitted. I'll be seeking out and showing some of the dozens that are now on display all around the region. This one, by Donna Lee Woolcott, is in front of the Salisbury Bank and Trust on Main Street in Salisbury. What a cool bear!! We do the cow thing here, I wish is was bears.